* Oversized and balanced, environmentally friendly (134A), refrigeration system, with airflow directed at pans for colder temperatures. Guided airflow provides uniform temperature in a 360? circle throughout cabinet for stay-fresh meats and cheeses, and older crisper salads. * Holds 33?F to 41?F product temperature in pans. * All stainless steel front, top and sides. * Stainless steel patented foam insulated cover keeps pans colder to lock in freshness - minimizes condensation. * Interior - attractive, NSF approved, white vinyl coated aluminum, coved corners and 300 series stainless steel floor. * Removable back hood and lid. * 5" diameter castors standard (legs available). * 8-7/8" wide full length removable cutting board. Versatile, sanitary, high density polyethylene provides tough surface. Large comfortable working area. * Adjustable, heavy duty, vinyl coated wire shelves. * Standard (1/6 size) 6'x6"x4" clear polycarbonate insert pans included. Also accommodates six and eight inch deep pans. (except M-C model). (TSSU-27-12M-B standard with nine 1/6 and three 1/9 size pans; TSSU-27-12M-C standard with twelve 1/6 size pans); positioned in countertop. * Foamed-in-place polyurethane high density cell insulation (CFC Free). * Doors swing within cabinet dimensions. * Rear Bumpers (except dual sided models). * Low profile models with 2" castor package. (31-1/2" work surface height, upcharge applies). 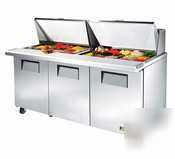 * Food prep access from both sides for high volume access along with the space efficiency of an island prep table. * Standard with 11-3/4" cutting board.